Our founder, Master Giorgio Di Costanzo, is an Italian-trained master in restoration of fine antiques, specializing in European and American furniture and art pieces up to 1200 years old. We have restored many precious historical artifacts including 18th-century furniture by Maggiolini and Renaissance sculptures by Erasmus Grasser, and have worked for many discerning clients including Brunelleschi's Renaissance-era Santo Spirito Church in Florence, Hearst Corporation, and Hearst Castle. Practicing in the San Francisco Bay Area for the last 40 years and in Italy before that, Master Di Costanzo is a foremost expert in restoring furniture and antiquities in the European tradition to maintain their historical value through the use of period-accurate methods, finishes, and materials. He apprenticed in Italy under Masters Renzo Migliorini and Mario "Marino" Vegni. He was also featured in Northern California Home and Garden Magazine. For a free consultation, please call 510.759.3331. We take pride in meticulously restoring weathered and damaged antiques either to their original condition or to a uniform condition that retains its historical value and authentic appearance according to the client's preference. We work in just about all materials including wood, marble, metals, glass, plaster, and polychrome. Eighteenth century French armoire was entirely structurally restored using all original parts except for new wooden nails made by hand. The nails were made with eighteenth century French plank oak to match the original wood of the armoire. 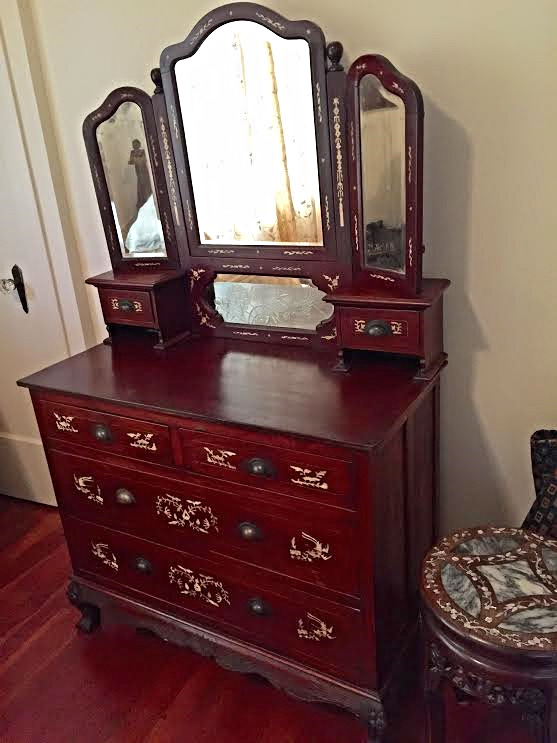 The piece was completed by restoring the finish to match the original color and style typical of the time period.. 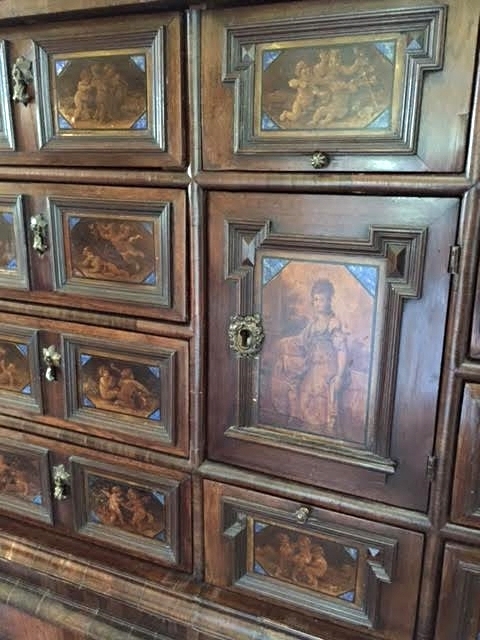 The finish on this late eighteenth century German china cabinet has been entirely restored to its original patina. The piece had been painted top to bottom with an oil-based paint in the 1960s, covering the original finish. To restore the beauty of the piece and increase its value, the oil-based paint was carefully removed to ensure that the original wood finish and 24-karat-gold-leaf applied to the pewter accents were preserved. Clear shellac was applied to the entire piece to enhance the original color. Scrimshaw reproduced and replaced. Cornices replaced on drawers. Veneer restored. Brass mounts cast and replaced where missing. Lock restored. Structural work done. Wood parts French Polished. Missing rosewood veneer replaced on sides. Set of 6 chairs: Five reproduction chairs from two of five original painted Portuguese 18th century beechwood church chairs. Accurately constructed, gessoed, carved, and painted. This block was created per customer request to hold their collection of antique hand tools. The piece was sculpted from a single block of wood and each slot was customized and cut to perfectly fit the shape and protect the individual tools of their collection . 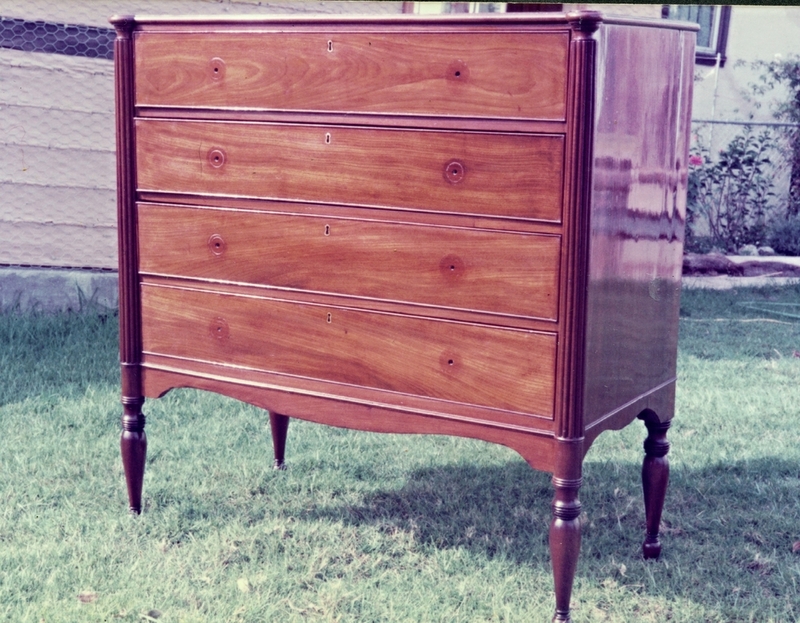 The face of the piece was designed and detailed with a unique handmade geometric inlay of rosewood to keep the customer's collection stored in style. Restored by replacing missing structural wood pieces and gilded to match the old gold patina. 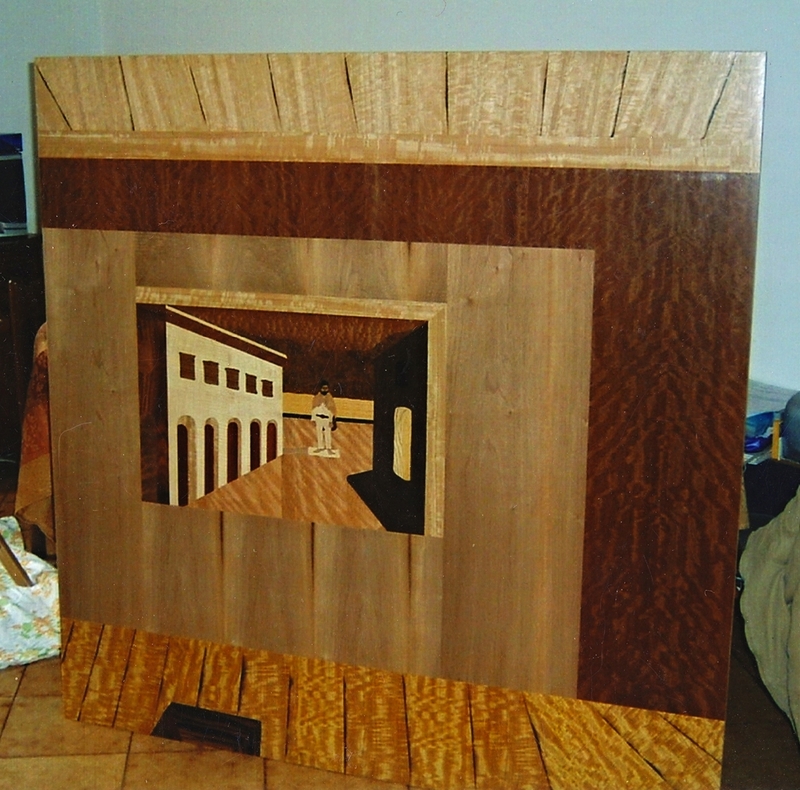 Reproduction panel of Giorgio de Chirico (1888-1978) using King wood and other exotic rosewoods with modern finishes. Accurately reproduced. Give your antiquities new life.